Warp Speed Team Time Trial: complete details now. Rather than restate those details, I shall simply direct you to the Team Time Trial page, also linked on your left. And how do you like the new site? Please feel free to direct feedback and corrections to the web guy. Read more about Warp Speed Team Time Trial: complete details now. EV is presently changing (rather dramatically!) the nature of our website. In the short term, this will simply be a pain for you, gentle reader. A few things will get a bit haywire, most likely. We promise you, we have important reasons for making these changes, but the best summary would be "we are messing with the website so that the web master does not go crazy." And really, that's always a good justification. We will return to bike-racing related content, or at least more photos making fun of club members, shortly. Harris-Roubaix: Get well soon, Tom! Well, that was a bit crashy, eh? 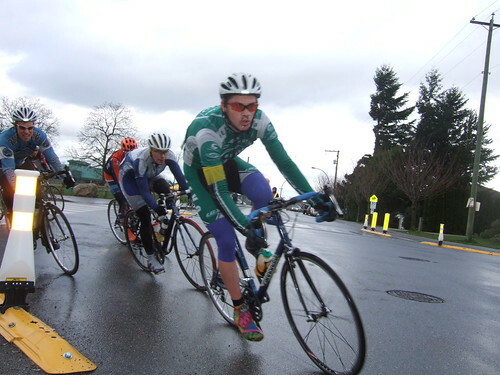 Tom Fairs, who both works for and rides for EV sponsor La Bicicletta Pro Shop, got caught up in one of the numerous crashes in the Cat 4/5 race at Harris-Roubaix this weekend. Tom broke 9 ribs, punctured a lung, and will likely be in the hospital for another week. He will probably be at home for another six weeks or so of recuperation after that. Read more about Harris-Roubaix: Get well soon, Tom! Warp Speed Time Trial, plus Warp Speed TEAM Time Trial! So, you're all stoked for the annual running of the Warp Speed Time Trial on May 13, right? Well now, we give you a bonus: on May 20th, Escape Velocity will present the Warp Speed Team Time Trial. We invite you to form a team and participate in this inaugural event. Course details to be confirmed, keep an eye on the website for more details. Read more about Warp Speed Time Trial, plus Warp Speed TEAM Time Trial!